« Short Reading List of Angling and other Environmental Literature. Recommendations? 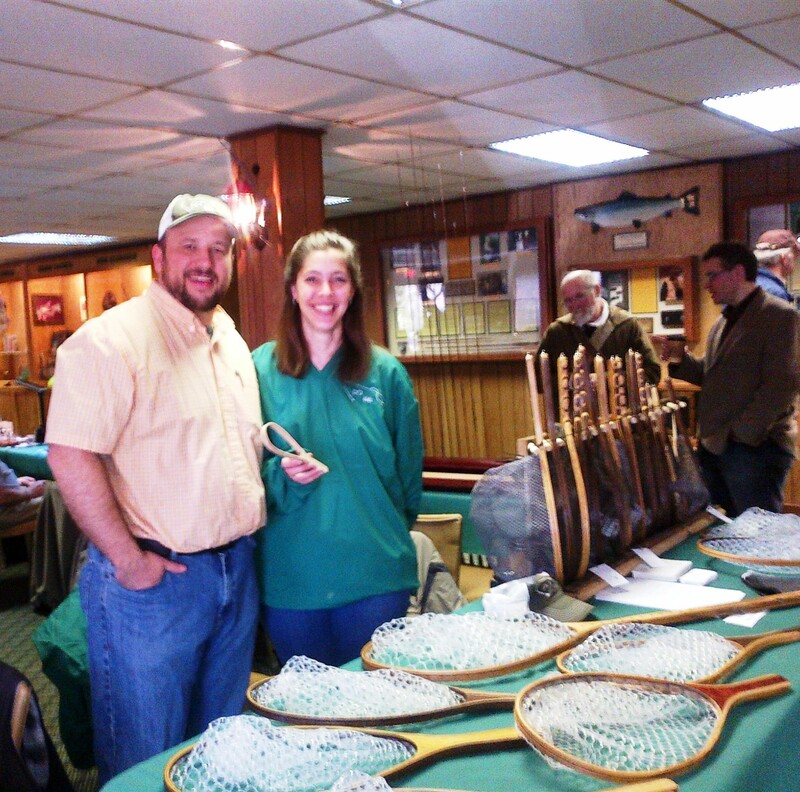 I recently went to the grand opening of the Pennsylvanian Fly Fishing Museum. There, I came across some wonderful landing nets from Drawbaugh Outdoors, based in Dover, PA. These beautiful nets are made by Chad and Billie Jo Drawbaugh (pictured), who are assisted in marketing and other matters by Jack Gotwalt. The most obvious characteristics of D.O. Nets are their beauty and quality. The picture above, which I took on my cellphone, does not do justice to them. No doubt, if you contact Jack, Billie Jo, or Chad, they will be happy to provide you with better photos of their products. In such photos, you will see that D.O. nets are carefully constructed in pleasing and practical forms. The fine construction of D.O. Nets contrasts greatly with that of many cheaper wooden and bamboo nets available today. Looking at these latter nets, you can see with your own eye that they are often glued and varnished imperfectly. Such problems in construction are no small thing; a few years back I picked up a cheap, wooden net after traveling to a fishing destination via plane. During my trip, I stumbled and very briefly placed some of my weight upon the net. It broke and splintered in a break that was comparable to an explosion. I’m grateful that a portion of the splintered net didn’t pierce my upper arm, especially since I was fishing alone, in a remote area, in grizzly country. Of course, imperfect construction can lead to much more subtle problems, such as premature delamination (I say “premature” because even the finest nets should be treated with at least some care). I am as impressed by the materials used in D.O. Nets as I am by their construction. Chad and Billie Jo can make a net of whatever suitable woods that a customer prefers. Many fly fishers interested in handmade tackle prefer exotic woods. I can understand this preference. To me, though, fly fishing is largely about place. It’s about getting to know a particular place–a particular ecosystem. This knowledge is necessary to successful fishing. But appreciating a particular place is what makes it pleasurable. Thus, I am most interested in tackle that reflects my relationship to the places I fish. In other words, I prefer domestic and often local materials. 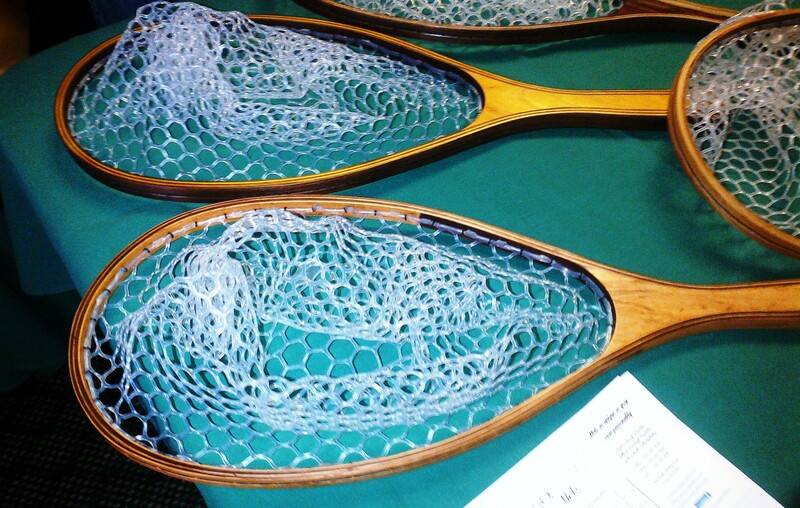 Drawbaugh Outdoors makes their standard nets of such woods. My profession is not one that typically brings great wealth, to put it mildly. As a man of modest means, I am very mindful of what I pay for fly fishing related items. It’s true, of course, that quality products are generally more expensive than inferior ones. And it’s also true that quality products will last much longer than inferior ones. Fortunately, D.O. Nets are both high quality and fairly priced. And while I have yet to purchase my own, I am willing to bet that D.O. nets will serve you every bit as well or better than a more expensive one. And, if you’re like me — if you are mindful of your relationship to place — the materials used in the nets might bring you some added pleasure too. You can contact Drawbaugh Outdoors at 717-580-5595 or at info@drawbaughoutdoors.com. You can also find them on facebook at http://www.facebook.com/DrawbaughOutdoors. If you’re in the market for a landing net that is both beautiful and practical, get a hold of Billie Jo, Chad, or Jack. They can provide you with a net that is suitable for landing anything from native brook trout to wild salmon and steelhead. They offer both nylon and rubber “catch-and-release” netting material. This entry was posted on April 29, 2013 at 11:12 PM and is filed under Fly Fishing, Fly Fishing Tackle, The Arts, The Environment. You can follow any responses to this entry through the RSS 2.0 feed. You can leave a response, or trackback from your own site. I’ve been thinking casually of investing in a rubber-mesh net with some local spirit crafted into the product, so this may be the ticket for me next time around. Thanks for the review! Indeed, it may be the way to go. My next net will be rubber too. I have a boat net like that, but the ones I carry with are all nylon. I like them, but I could do without my fly getting caught every so often. You’ve been reading my mind. I was just thinking I’ve got to get a new net. Thanks for the review.